I want to thank Daniela over at Purple on Paper for this award! She thinks I rock. LOL And you know what, I think she does! 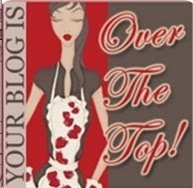 If you haven't visited her blog...you should, she has some GREAT stuff over there! Thank you so much Daniela, it's always great and very humbling to know that you inspire someone. Here's the rule: I need to pass this award on to five people, post on their blog to let them know I left this award, and then I need to answer a list of questions in ONE word. Narrowing it down to 5 is hard! All of these ladies are constantly inspiring me and you should check them out if they are new to you! 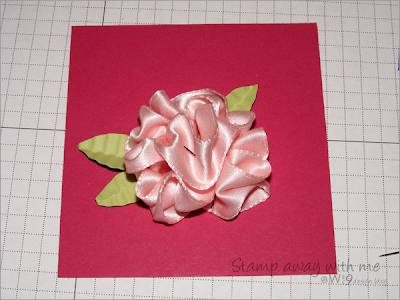 As promised, here is the tutorial on creating flowers from ruffled ribbon. Hopefully you find it easy to follow. 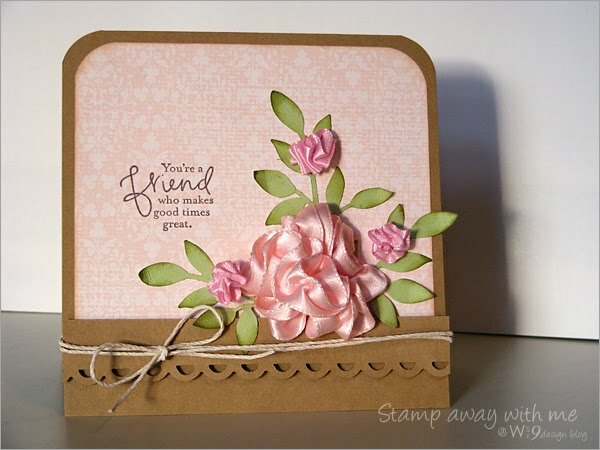 You can find my original card featuring these flowers here. 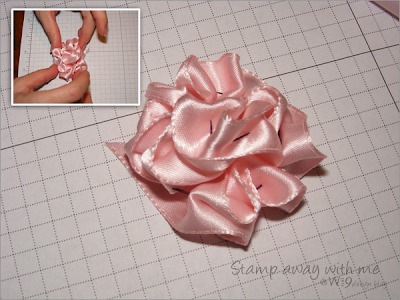 This works well with satin ribbon (I haven't tried it yet with others, but would love to see if some of you try). 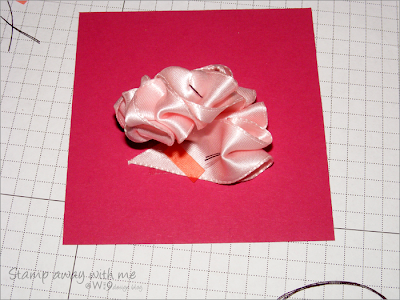 I am using a satin 7/8" ribbon to create a large bloom. 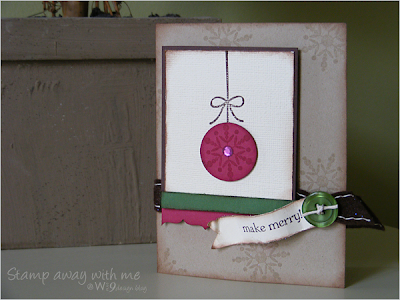 I am also using a contrasting thread color for some contrast in the tutorial. I would suggest using the same color thread as your ribbon. This is actually really easy. The basic concept is something I learned from my mother a couple of years ago when she "bustled" the skirt of a costume for me. First, thread your needle and tie off a triple knot at the end, leaving about 2" of thread after the knot (in case the knot slips through the ribbon, you can pull it back). 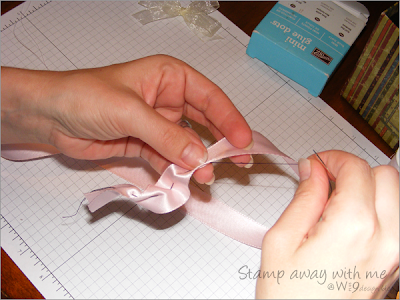 Then, using a straight stitch, stitch straight down the middle of the ribbon. The longer your stitches, the bigger your "ruffles" will be. Shorter stitches will create tight "ruffles", great for making buds. After you have stitched a few, you can check your progress by holding the ribbon with one hand, while gently pulling the side of the thread with the needle with your other hand. This should cause the ribbon to bustle as the thread is pulled taught. Continue stitching until you have reached the desired length. You can keep checking your progress by pulling the thread every so often. 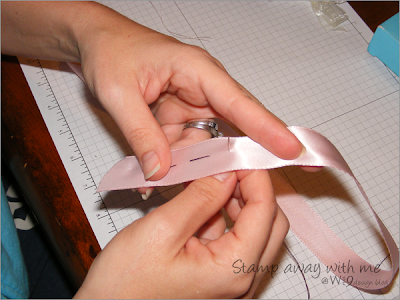 Once you've got it to the length you want, pull on the thread to bustle the ribbon, tie it off, and trim. The tighter you pull the closer and tighter your ruffle will be. Play with it a little to get your desired look before you tie it off. Now use your fingers to curl it up and shape it. That is pretty much it! Now we just have to adhere it to a card. I use Sticky Strip as this much material really needs something strong to hold it. 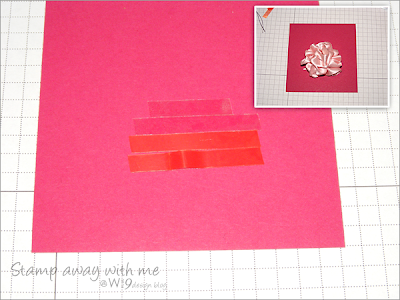 Line up a few rows of Sticky Strip on your cardstock in the correct size for your flower and add your flower. I layed mine out on the side first, and then picked it up in a little scrunch with my finger tips and then just sat it on top of the Sticky Strip. 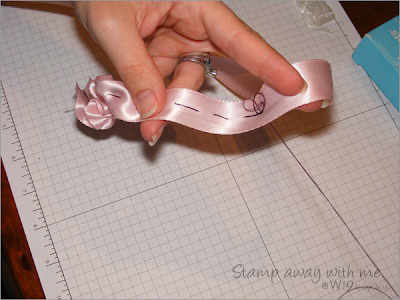 You may have a little area where the ribbon overlaps that will need a little me adhesive. Just cut off a little more Sticky Strip and add it where needed. Below is a shot of where mine needed a little more. Last but not least, add some leaves of your choice! I hope you've enjoyed and I love to see what you've done with it if you decide to try it! Today is a two for one post. 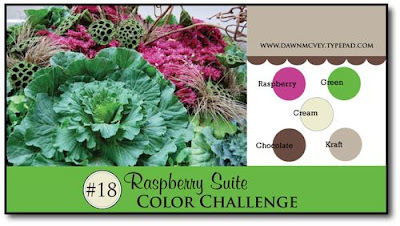 Over at Dawn McVey's blog she is having another color challenge. Such a pretty palette. I love the bright bold and clean lines of that first card. There is actually a story behind that one. ;o) It was my original plan for the challenge, but after working and re-working and giving up in frustration because I just couldn't get it to look right, I ended up with the card below. But like all things, sometimes if you just walk away for a bit...the answer will come to you. Now, if you take those same colors and give it just a tad deeper in overall shade, they make a gorgeous rustic Christmas palette. I just love that snowflake from SU! 's Berry Merry set. And all of the inked edges on this card just make it feel so cozy. And that felt ribbon...I just can't get enough of it! Thanks for looking and I hope everyone had a fabulous weekend! 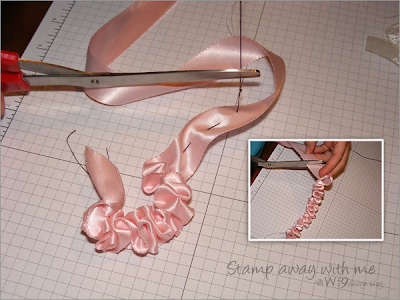 BTW, I will work on putting together that tutorial this week on the ribbon flowers. Thanks so much for all of the kind comments! OK this challenge was super hard for me. I was not feeling it AT ALL...but I was determined not to let it stop me. LOL. 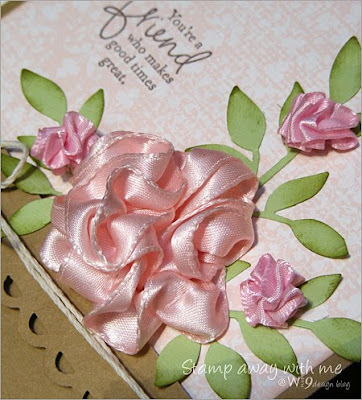 Over at Moxie Fab World there is a challenge to incorporate ruffles into you card. Much easier said than done for me. As I was hand sewing some ribbon to create a "ruffle", I noticed that it naturally curled up when I was done and layed it down. And as I looked at it, I got an idea....hmmmm, I wonder how that would look as a flower. So I got out my Big Shot and cut out some leaves, and started to layout my card. I am actually really happy with how it turned out. 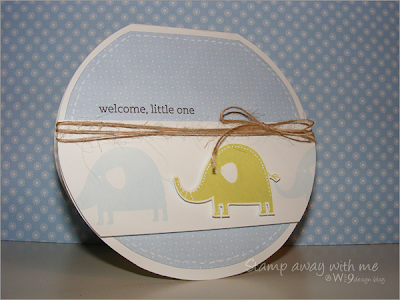 I decided it needed some little buds as well, so using a smaller width ribbon I created a few. Here's a close-up of those yummy little flowers. If anyone is interested in how to make the flowers out of ruffled ribbon, just leave me a comment and I'll create a little tutorial. ETA: The tutorial for creating these yummy flowers is now available, you can find it here. As always thanks for looking! And on a side note, please say a little prayer for Deanna, Somer Thompson's mother. She was a friend of my niece's, they all used to walk home together. And it all took place in my childhood neighborhood, about 5 streets down from my mom, where my boys play almost everyday. So if you could, say a little prayer for her so that she may have the strength to make it through this devastating loss. Hope you are having a great week and thanks for looking. Be sure to click the link above and check out the other great entries. 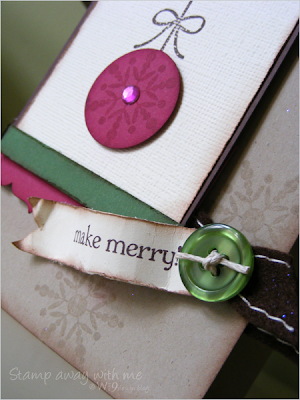 After working on my Double Duty: Berry Merry cards Saturday, I had some left over scraps laying around and decided not to let them go to waste. 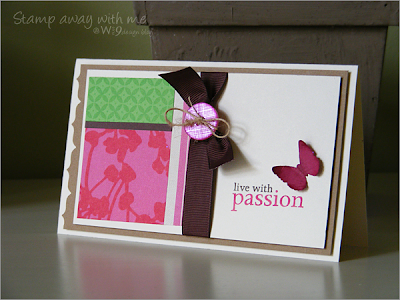 So I created this cute little tag to go along with one of the cards. How cute would this look either hanging from the handle or adhered to the front of a Kraft gift bag? It's time for another round of Double Duty, and it's definitely overdue. I am having so much fun with this set. It is so versatile! Definitely not just a Christmas set. I've already used it quite a bit. 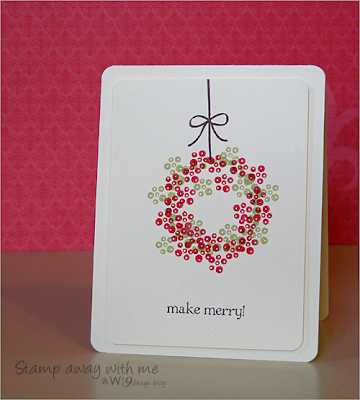 It's the Berry Merry set by Stampin' Up! and it's currently available in the Holiday Mini. 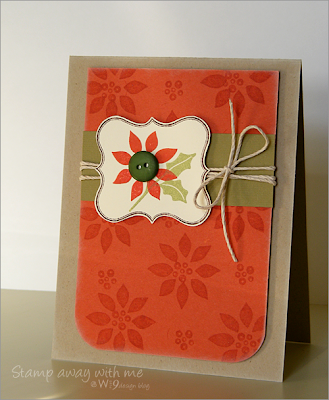 For the first card I simply used the poinsettia base to create a background paper using Versamark on Dusty Durango cardstock. I know...orange for a Christmas color? But it works, I tell ya. 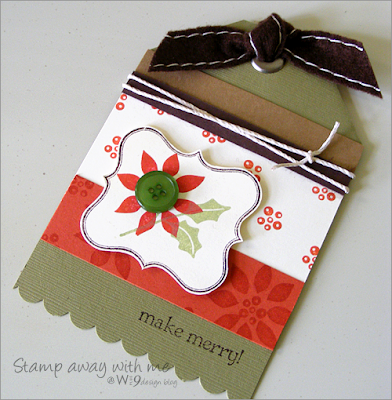 Then I added a strip of olive and created a focal point using the leaves, the poinsettia, a button in the middle and framed it with a Hero Arts label. I even finished the inside. So after doing the inside I got an idea for the second card. Another easy one! This one is pretty self explanatory and doesn't really need a ton of explanation. ;o) As always, thanks for stopping by! Hopefully you found something to get those creative juices flowing. This is one of those cards that I didn't really care for at first, but the more I look at it, the more it grows on me. Do you have any of those? 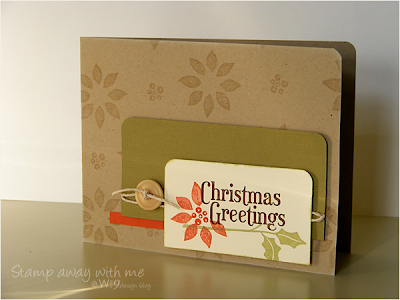 This was a very simple card to create, and uses little supplies. Great for mass production. As always, thanks for looking! I think I found my mojo...and I think it is PINK. For a girl who grew up hating pink, I sure do love it now. I find it to be the EASIEST color for me to work with. Go figure. 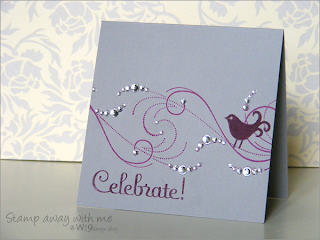 They are having a fun challenge over at Moxie Fab World and the focus is all about gradients! You know, I never thought to incorporate a gradient into my cards. I mean, I use gradients everyday, everyday in design, literally...but it never even crosses my mind when I craft. So when I saw this challenge, I just knew I had to try it. I decided to mimic a little girls skirt, you know, all those layers of ruffles in yummy pinks. Ha! I even crumbled the pieces of cardstock before adhereing for a little movement. Honestly, when I sat down to sketch it, I started with the bottom and the rest just fell into place from there. 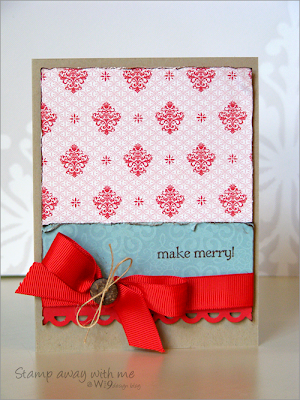 A little backround stamping on the top, some ribbon, a button, and faux stitching to finish it off. So, was there something you hated as a child, and now can't get enough of? Over on Nichole Heady's blog she is having a World Card Making Day Challenge. She featured 4 countries in 4 challenges. Japan, Mexico, India, and Australia. I was super busy and only had time to do one. But I think in all of the excitement, I just couldn't get Japan off my mind, because even though I was going for Indian ispiration with the rhinestones...I think some Asian influence snuck it's way in. LOL Hope you enjoy and thanks for looking! I'm sure this are some gorgeous cards for this color combo. The colors were red, aqua, chocolate, kraft, and optionally cream. I used SU! 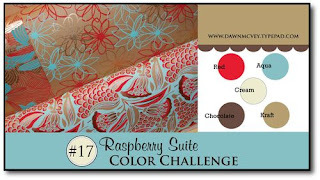 Real Red, Baja Breeze, and Kraft cardstock, and Colorbox liquid chalk ink in Dark Brown. Be sure to click on the banner to see all of the contributions. Time for another challenge! 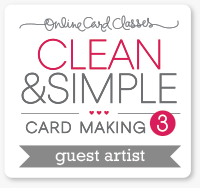 This round I decided to do a color challenge, and with Saturday being World Card Making Day, what more inspiration does one need?! Isn't that a great fall color pallette? If that doesn't get you in the mood for fall...it's hopeless! 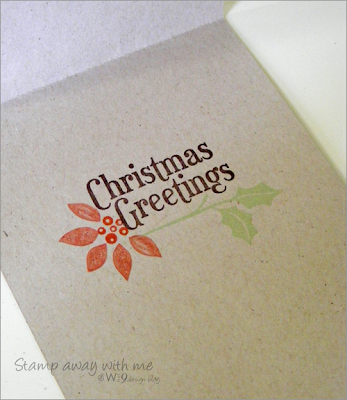 ;o) I've used Stampin' Up! color names to describe the colors, but anything close will do if you don't have any on hand. 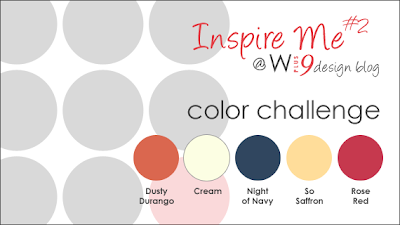 Details: Create a card, scrapbook page, or any item using the colors above. Post your creation on your blog and then leave the URL to your blog ENTRY (not main page) on Mr. Linky below. ETA: Deadline is Thursday, Oct. 15th at 10:00 p.m. Sorry I missed it the first time around. On a side note: Thanks for all of the WONDERFUL comments you guys have been leaving lately. It really motivates me to keep sharing (even though I have to do it in the wee hours of the night) as I'm sure a lot of you can sympathize. So again thanks for the comments and thanks to all of you who continue to share on your own blogs as well!